During 1939 the Air Ministry was looking to build a large bomb store capable of storing a large amount of ordnance. In Llanberis the Glynrhonwy Isaf slate quarry was sitting disused, upon inspection it was deemed suitable for the Air Ministries needs of storing 18,000lbs of bombs. Following the success of the design employed at Harpur Hill, the Air Ministry decided to employ the same design. The layout of the quarry was a number of deep excavations, linked by tunnels. Due to the depth of the tunnel, the store was built over two levels, and 40ft of broken slate was used as protection. Only the eastern pit was converted to a bomb store, with the western pit remaining undeveloped. 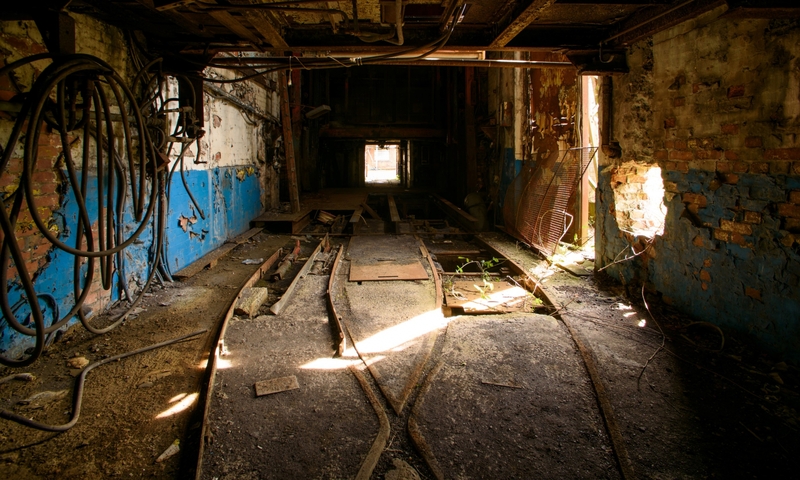 Bombs were transported into the site on narrow gauge railway, and lifts provided access to the upper levels. During the construction of the store, the treasury pressured the designers to reduce costs on the design and speed the construction, this was to lead to disastrous consequences only 6 months after the store was opened. In January, 1942, two thirds of the entire structure collapsed under the weight of the roof. The collapse completely engulfed a train loaded with ordnance, and over 14,000 tonnes of bombs. The comprised approximately 14% of the entire bomb stock of the RAF. The majority of the bombs were recovered from the site, and the site cleared of collapse debris. No ammo was stored at Llanberis again, the underground sections were abandoned and the open pit used for storage of incendiaries. The depot remained in use throughout the war, and for a number of years after, eventually closing in 1956. However, a small detachment of bomb disposal experts remained to patiently clear the dumped weapons  after the war, a large quantity of weapons had been dumped into the pits. 15 years after the site had closed, the decision was taken to remove all of the unexploded ordnance that was still contained within the site. Upon investigation by navy divers, it was found that a large amount of explosive was found on the bed of one of the pits. 20,000,000 gallons of water was pumped from the lake, and the bed was finally revealed its secrets. Over 350 tonnes of explosives were found, along with 1,400 tonnes of non-explosive ordnance. The site was cleared and then vacated. Here is a collection of information related to the Llanberis Ammo Store.